Just when you thought the only fighting on Twitter these days had to do with politics, Showtime Sports is bringing a livestreamed boxing card to the social network Saturday night. Showtime is holding its free preview weekend through Monday, during which the premium cable network will be available free-of-charge to more than 73 million households, and the Twitter livestream is part of that initiative. 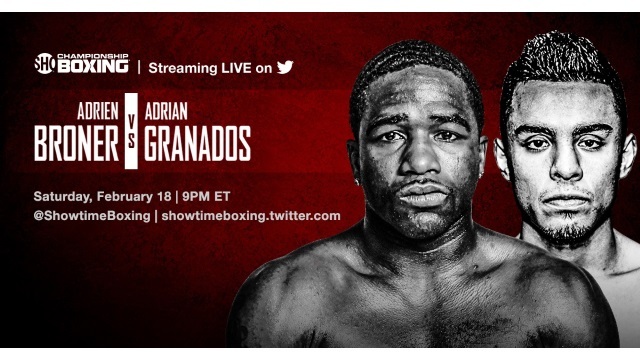 The Showtime Championship Boxing tripleheader will be available to Twitter users, whether or not they are logged in to the social network, starting at 9 p.m. ET/6 p.m. ET Saturday, via Twitter’s Explore tab, Twitter Live and @ShowtimeBoxing. The main event pits former four-division world champion Adrien Broner against Adrian Granados in a 10-round welterweight bout. The other featured matches are: WBA Welterweight Champion David Avanesyan against former two-time champ Lamont Peterson, and a 10-round light heavyweight fight between 175-pound contenders Marcus Browne and Thomas Williams. Twitter is where fans go to for live conversations about boxing. Our collaboration with Showtime Sports will provide fans access to the live video stream of Saturday night’s best-in-class championship boxing coverage and the live conversation all on one screen. We are in the midst of an unrivaled run of seven live boxing events over an eight-week span on Showtime and CBS. The sport of boxing is on the rise again, and the best and most meaningful fights are on Showtime. With this unprecedented livestream on Twitter, we have the opportunity to reach boxing fans and casual observers everywhere with the industry-leading boxing programming we deliver to our subscribers on a consistent basis.